Periodically tidying up your computer by clearing or removing temporary files that are gradually filling up space on your system will help to speed up the system and enhance performance. The temporary files that are accumulated over time will cause problems to the system if this periodical maintenance is not carried out. Windows come with all the necessary tools such as Disc Cleanup to allow users to do the necessary cleaning. If users do not like to use the Windows cleaning utility, applications such as CleanMe can be an alternative solution. 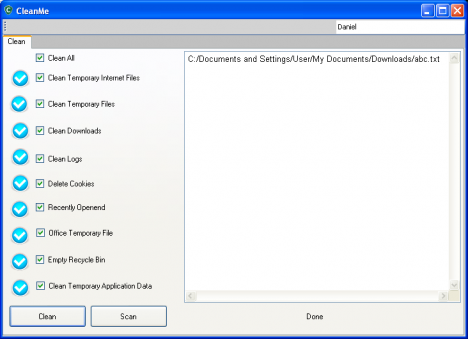 CleanMe is a free application that can clean up the system’s temporary files such as recycle bin, temporary system files, temporary internet files, temporary application data, application logs, system logs, history, cookies, recently opened, office temporary files and downloads. Users can install or keep the standalone version in a USB drive without installing it in system; it can be carried around and run from the portable drive. This system cleaning tool allows users to select particular items to perform the clean up.